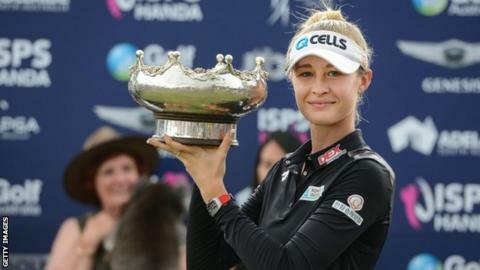 American Nelly Korda continued her family's remarkable success in Australia by winning the Women's Australian Open in Adelaide. Korda finished on 17 under par, two clear of South Korea's Ko Jin-young. Korda is the daughter of former tennis player Petr Korda who won the 1998 Australian Open men's singles title. Her sister Jessica also won the golf Australian Open in 2012 while her brother Sebastian won the tennis junior singles title last year. The 20-year-old took a three-shot lead into the final round at The Grange and shot a five-under-par 67 to win. England's Jodi Ewart Shadoff finished in a tie for eighth on nine under. Korda was born six months after her father won the Australian Open in Melbourne, the Czech's only Grand Slam title. At the start of the week she said she felt "so left out" when her family discussed their Australian titles and when she completed her own victory she celebrated with her father's trademark scissor kick. "I'm finally a part of the club," Korda said. "I mean this win was really special for my family. "I think there's something in the air here, we love coming down under. "I just got off the phone with my dad and he said, 'Well, congratulations, you're part of the Korda Slam now'."